Everyone who regularly reads this blog probably knows about my love of Kelley Armstrong’s books, especially her Cainsville series. This series is one of my absolute favourites and I can’t wait to see what Liv and Gabriel uncover next about their heritage and Liv’s parents. Personally I think this synopsis is terrible – don’t let the mention of a love triangle fool you: yes, there’s romance, but it certainly doesn’t dominate the story. And I think we all know who’s gonna come out on top of that triangle…just saying. So far this image is the only example of cover art that we have for Deceptions, but I’m hoping that the Canadian publisher – Doubleday – went a different direction with the cover art. The cover isn’t bad or anything, I just don’t think it reflects the series. And of course, it has no continuity with the other releases in the series. 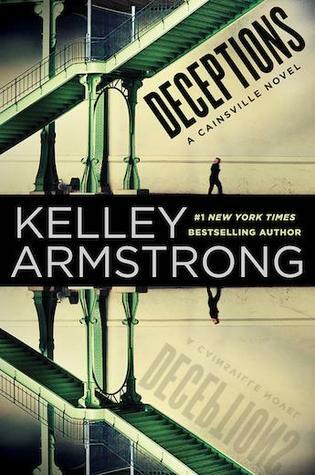 Cover art issues aside, Deceptions by Kelley Armstrong is easily my most anticipated book of 2015. I love Kelly Armstrong too, but I haven’t started this series yet. It’s going on the list, however! I agree that cover doesn’t seem to fit the story. Maybe it’s just a placeholder? I’m hoping that you’re right and that cover is in fact a placeholder…because that spine would not look right next to books one and two on my shelf! Regardless of wonky graphic design, you definitely need to give Cainsville a go – I’m loving it! Never read any Kelly Armstrong, and I know I have to. I agree with Tammy, this cover is very interesting…it just doesn’t seem to fit the series, let alone story. Glad I’m not the only one who felt this. My guess is it’s a placeholder or the cover of another country’s edition, because it doesn’t even go with the other covers in the same series. Fingers crossed! I know that it’s shallow but things like matching cover art really bug me. Honestly, I’d rather the entire series had ugly covers that matched rather than an artwork change halfway through. Say what you will about those Sookie Stackhouse books, at least they’ve all got the same look to them!